Larson Boats of Little Falls, Minnesota which celebrated over a century of boatbuilding a couple of years ago, for 2015 offers three distinct boat lines; Larson LX, LSR, LXi, and Cabrio series of runabouts, sportboats, and cruisers, plus the Escape by Larson series of aluminum pontoon boats, and the Larson FX series of fibreglass fishing boats. 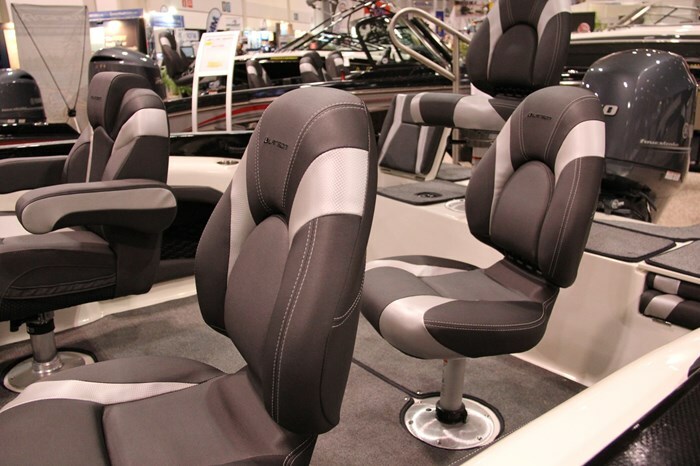 Larson’s FX series consists of a total of nine models; four each of tiller and dual console models in sixteen, seventeen, eighteen, and twenty feet, and one side console model in sixteen feet. The FX 1850DC Dual Console, subject of this review, has identical dimensions as its FX 1850TL Tiller model sister, itself a new model for 2015, but the dual console configuration not only has a higher capacity horsepower rating of 200, versus 90 for the tiller version, but the dual console version is considered much more acceptable and adaptable as a dual-purpose boat for not only fishing, but also for full family activities including cruising and watersports fun, etc. About the only thing that hasn’t changed about Larson’s best selling model FX 1850DC for 2015 is its model designation. 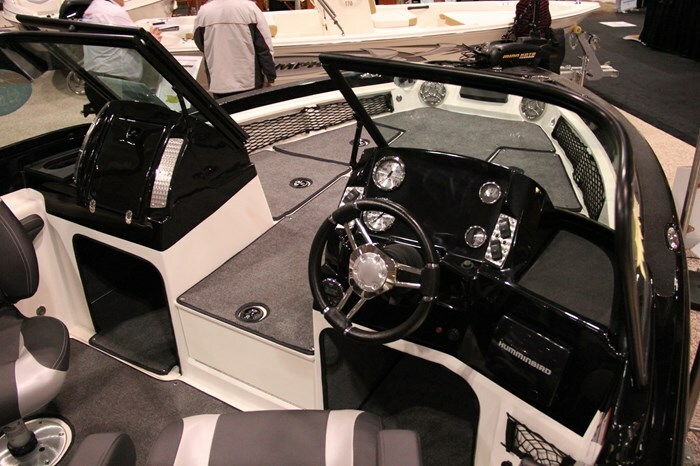 This is essentially a brand new boat both inside and out. One major change is its beam increasing from seven feet, eight inches to a full maximum trailerable beam of eight foot, six inches. In fact, Larson claims it has the largest beam in the 18-foot fibreglass fishing market. Other major changes include complete redesign of both the driver’s and passenger helms. 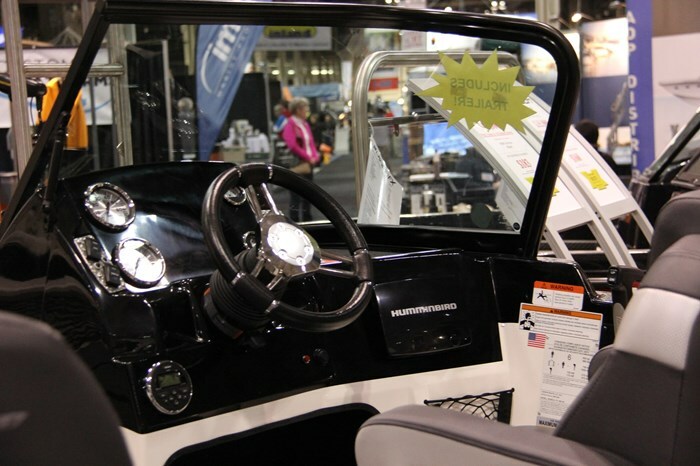 The new driver’s helm stacks the standard large diameter tachometer and speedometer to the left of centre and stacks the standard smaller diameter trim and fuel gauges to the right of centre leaving a large, flat centre surface right ahead of the custom chrome and black steering wheel to flush mount your choice and size of GPS/fishfinder screens. The passenger console now houses a huge glove box with hinged lid. Large open, finished areas below each console provide lots of foot room plus covered storage capabilities. Another major change is seen in the lockable rod storage compartment housed between the two helms and which extends forward into the raised bow casting deck. This compartment now not only stores up to four rods up to seven feet, six inches long in dedicated tubes, but also leaves the centre section of this compartment open and available to securely store watersports accessories such as waterskis. The walk-thru windshield has also changed this year from a five-piece unit to a thoroughly modern looking three-piece unit with rounded corners and better sightlines. 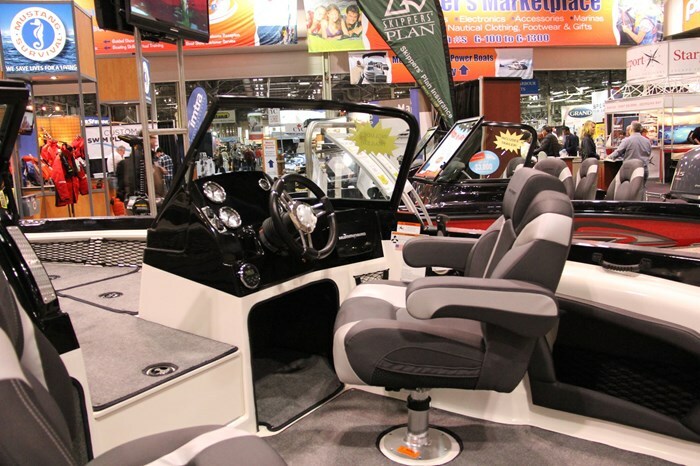 Two high-back moveable fishing chairs with headrests and armrests are provided with six seat bases within the integrated fibreglass floor in which to mount them; four bases within the cockpit and one each centred on the bow and stern casting decks. Almost the entire floor area of the bow casting deck is devoted to covered and finished storage areas plus additional bow side open storage areas have netting over the openings to hold stored items in place. Additional side storage is also found under the cockpit gunnels on both sides plus within the stern casting deck. A standard 25-gallon aerated livewell is also housed within the stern casting deck. 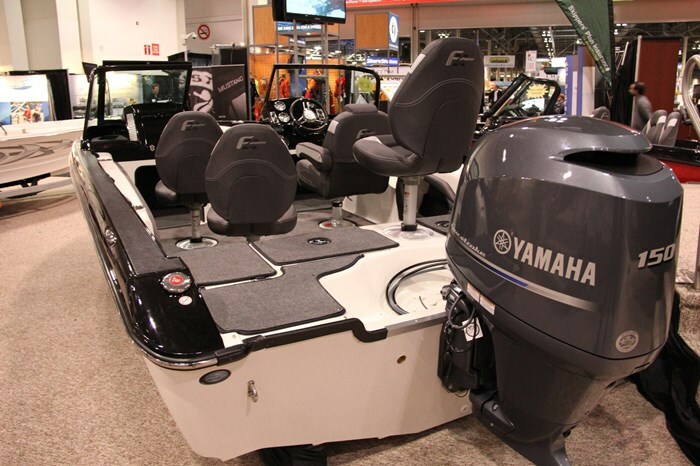 A dedicated trolling motor battery storage compartment is also standard. Other notable standard equipment includes a black painted Eagle trailer with disc brakes, swing tongue, stainless steel fenders, and chrome rims. 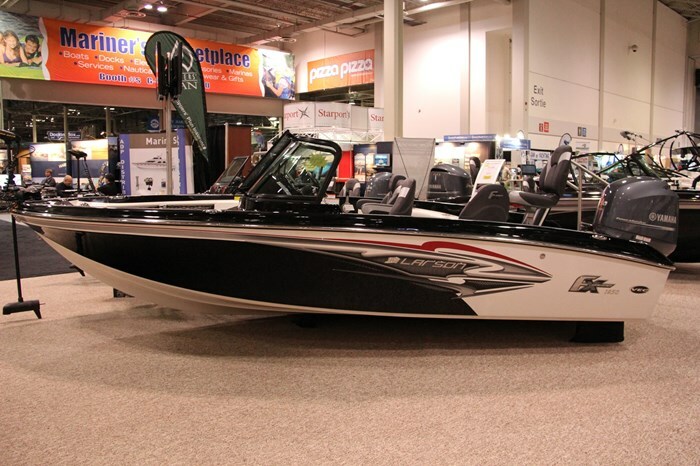 Hull graphics are standard and you get to choose from four colour accenting choices of red, grey, black, or base white or from four choices of FX’s new “Shimmer” colour schemes. 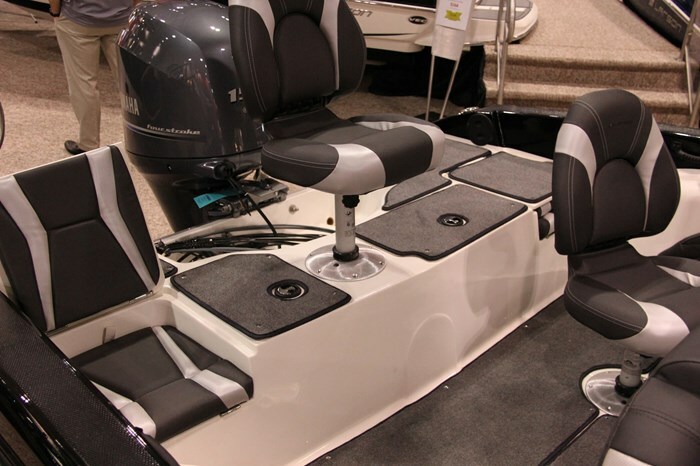 Notable optional equipment for the FX 1850 DC includes a 4-gallon aerated bow baitwell, livewell timer, a 2 or 3-bank battery charger, 12-volt power outlet, stereo AM/FM with four speakers, plus MP3 and iPod ports, snap-in cockpit carpet, choices of additional seats, several canvas options including bimini top and full enclosure, and highly recommended hydraulic steering with tilt steering wheel especially if you approach toward the maximum horsepower rating. 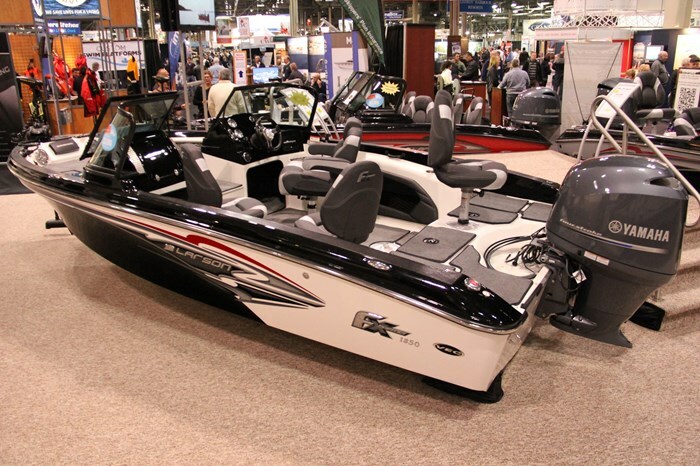 And of course you can choose your favourite brand of outboard power from Mercury, Suzuki, Evinrude, Yamaha, or Honda.